Dishearteningly, a recent survey indicated that more than three-quarters of adults in the United States are not educated about the origins of most puppies available for sale in pet stores. A Home for Dakota, a title from a Vegbooks favorite publisher Gryphon Press, is the story of how one small breeder was rescued and given a chance at really living life. A Home for Dakota opens with an illustration of caged dogs and puppies in a dark room. Dog Number 241 looks straight at the reader as the text discusses her dreadful living conditions. Describing her experiences from her canine perspective, Number 241 is rescued and given the name Dakota. With the unconditional support of her foster mom, Dakota slowly and warily learns about being a dog whose world has suddenly expanded beyond the confines of a small cage. When it comes time for Dakota to move from her foster home to a permanent placement, there is a snag: the girl with whom Dakota is supposed to live does not want her. Dakota, ravaged by her ill treatment as a breeder, is still missing her fur. Sweetie, the girl who is to be her new companion, has also lost her hair due to treatment for serious illness. The author and illustrator both do a striking job of portraying Sweetie’s pain in seeing another vulnerable creature as well as Dakota’s pain in being spoken to harshly and rejected. “I want a perfect dog!” Sweetie cries. Soon enough, a pink-hatted Sweetie returns, full of remorse over her treatment of the timid dog and hopeful about the future. Dakota is still nervous, but with her foster mom’s reassurance, she sets out for her new home. Sweetie quickly falls in love with Dakota, the feeling is mutual, and, as Dakota points out to the reader, they both end up growing their hair back. A Home for Dakota is an excellent way to introduce young children to the complexities of puppy mills and the poignant issues surrounding them, including the importance of foster placement. When the children in your life are ready to hear specifics of why you encourage rescue and adoption of companion animals, please check out A Home for Dakota. 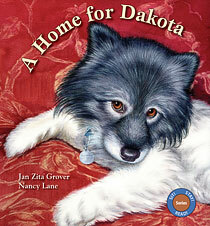 You and your child will fall in love with Dakota and the humans that offer her a chance to truly live.